The 2016/2017 summer production season is by now moving into the harvesting and final marketing phase for soybeans, sunflowers and other summer crops. This year has been characterised by good to very good rains prior to the planting season interspersed with an extremely hot and dry November and December. The period just before your soybeans have reached physiological maturity is the ideal time to evaluate all the previous management decisions coupled with rainfall received contributing to an interim yield estimate that can be compared to a final yield at combining. A yield estimation at this stage can provide valuable information as to the detailed planning for the commencement of combining for various lands, combine capacity required, total mass of the expected crop, land to storage delivery, storage capacity required, cleaning and drying costs to be incurred, and marketing strategy. Yield potential is essentially an estimate of four components which are the number of plants per hectare, number of pods per plant, number of seeds per pod and number of seeds per kilogram. Use a tape measure to measure a length of 10 metres of plants in a planted row of soybeans in at least 10 average crop representative sampling areas in a particular land. Avoid headlands or cross planted areas at the edge of lands being assessed. Count the number of pod bearing plants within each 10 metre length of row. Divide the total from 10 samples by 10 to give you the average plants per 10 metre row. Multiply this answer by 10 to give you the number of pod bearing plants per 100 metres of planting row in a planted hectare area measuring 100 metres by 100 metres square. For ,92 metre row spacing multiply the above answer for 100 metres of row by 110 planted rows per hectare to give the required answer of pod bearing plants per ha. Use a multiplying factor of 133 rows per planted hectare for ,75 metre rows. Select 10 plants at random and count the pods. Divide by 10 to get an average number of pods per plant. Keep in mind that pods lower than 12 cm from the soil might not be picked up by the combine head. Open the pods and assess the number of fully developed seeds per pod which usually vary from 2 to 3 seeds per pod. In a dry year use 2, in an average year use 2,5 and in a good year use 3. Multiply the average number of pods by the average number seeds, times the number of plants/ha to give you the number of seeds/ha. As can be seen in Table 1 seed mass varies considerably and can affect the results of the yield estimation quite considerably. 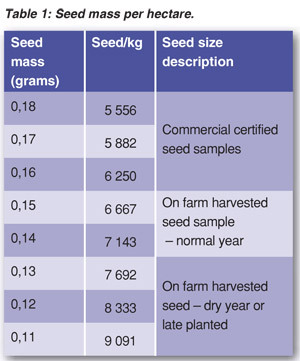 Choose or estimate or weigh seeds to be accurate and multiply the number of seeds/ha by the seed mass per seed. Divide by 1 000 to get kg’s/Ha and again by 1 000 to get t/ha. Reduce this answer by 10% for harvesting and shattering losses. Having assessed the lands as detailed above and given the following the calculation is shown below. Average no of plants per 10 metre tests 220; row width ,92; pods per plant 20; seeds per pod 2,5; mass of seed kernels 0,15 grams. 1,815 t/ha less 10% = 1,815 x ,90% = R1,64 t/ha estimated yield. One of the most important factors in successful soybean production is having your own combine maintained in excellent condition with the correct settings for drum speed and header and immediately available as each land needs to be combined. If a mature crop has rain on it shattering losses can be huge. If using a contactor make sure that he will be available within days of having been given notice that the crop is ready. Use a yield estimation of soybeans as a harvesting planning tool for the current crop as well as an exercise in assessing which management techniques will result in successful production in future seasons.